I want to display A.png and B.png together, A left / B right or A top / B bottom. separately, then resize and move the two windows next to each other, but that's a pain if you do it a lot. Can it be scripted ? If not, is there an opensource preview-like that can display side-by-side ? Customise the coordinates as you wish depending on monitor resolution. I would do this in Automator as a Service. 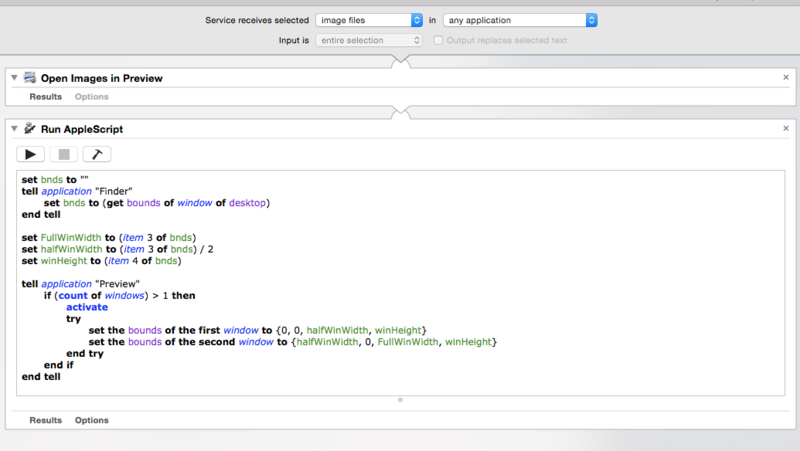 Using a Open Images in Preview Action and a Run Applescript Action. So I could select the wo files and run the service on them. The Applescript code should get the Size of the screen and set the bound of the windows accordingly. to make Preview.app scriptable for something like these simple commands. Two page continuous view in Lion Preview? Preview: How to set over-under configuration instead of side-by-side in “Two Pages” view?